Steez Promo is pleased to present the Phase 2 lineup for the first annual Moonrise Festival, set to take place June 8th and 9th from 11am-11pm at Sun Park in Baltimore, MD. With over 20 additional acts, including multiple headliners, this announcement brings huge amounts of talent to an already huge lineup. 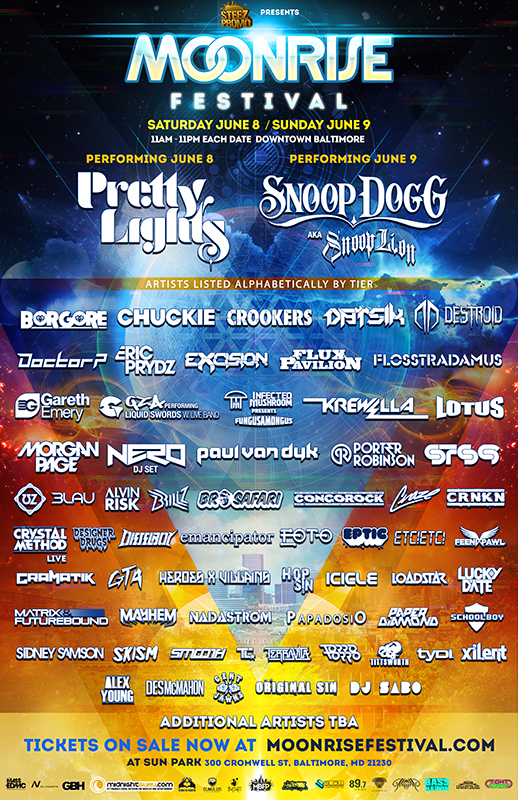 From house and progressive acts like Eric Prydz, Congorock and Feenix Pawl, to the biggest names in dubstep – Nero (DJ set), Borgore, Skism, Krewella and more – and even the Doggfather himself, Snoop Dogg, the Phase 2 lineup has something for everyone. They’ll join a lineup already jam-packed with names like Pretty Lights, STS9, Flux Pavilion, Destroid, Flosstradamus, The Crystal Method, and many more. And they’re not done yet; watch out for another announcement – featuring all local and regional talent.